how to make ghee - How to make clarified butter - how to make desi ghee. 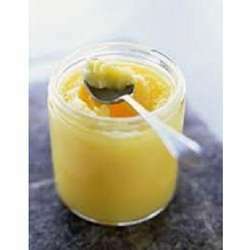 You will find step by step instructions here about how to make ghee. Ghee or desi ghee is clarified butter. Making ghee at home is a simple and easy process. The tools needed are few. You need a thick bottomed karai (deep pan - nonstick or iron) and a ladle or a spatula. And you need only one ingredient - unsalted butter - to make desi ghee. When you make it at home and the wonderful aroma or ghee making fills the home, you will love it. Once you learn to make it at home, and see how simple it is to make ghee at home, you will continue doing it. Plain, unsalted butter - 500 gms. Heat butter in a pan on medium heat and let it melt. After it melts, there will be some white foam on top. Keep cooking till a clear liquid fat forms. Stir it once in a while.The milk solids will separate from the fat, continue cooking. Once the fat (that is ghee) starts to separate from the milk solids and the milk solids start to brown, you should watch it. Keep stirring and once the milk solids are evenly light brown, take the pan off the stove. Filter it with a stainless steel filter in the jar you want to store it. It will keep good for more than a month. If you plan to keep it longer, keep it in the fridge and take out as and when you need it. You may stir it once in a while if you don't want the milk solids to stick to the bottom. It is also ok if you let the milk solids stick to the bottom but you need to watch carefully that it does not get stuck and burnt. Cleaning the bottom needs more scrubbing too if the milk solids get burnt. In making ghee, the trick is switching off the stove or taking the pan off the stove at the right time. So once the fat starts to separate from the milk solids and the milk solids start to brown, you should watch it. Lightly browned Milk solids can be mixed with sugar or jaggery and it tastes like toffee. The brown milk solids contain some amount of ghee. You may add it to any vegetable or lentil curry or collect the ghee present in the residue by following the steps given below. My cats love the milk solids. After you have filtered the liquid ghee on the top into a container, add the residue back in the pan where you made the ghee. Add two cups of water to this residue. Bring to boil. Let boil for a minute. Switch off the flame. Let cool completely. Take a tall container which you can keep in the fridge. Pour the cooled water mix in this container. Leave the container with the boiled water and milk solid mix in the fridge for 2-3 hours. The fat (remaining ghee) will float to the top of and solidify. Remove this solid ghee in a bowl. Strain the remaining water so you can separate the brown solids. The liquid (water) can be used to mix chapati dough or to a curry or to vegetable rice etc. This water has ghee flavor. The brown milk solids may be thrown away or fed to your pet if that is alright.